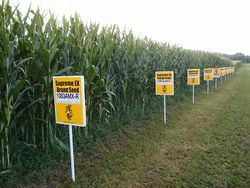 Genetically modified crops, also known as GMO crops have had a bad reputation due to the skepticism of their effects on humans and the ecosystem. however, they can be very helpful. Scientists were first introduced to the selective breeding and modification of plants by Gregor Mendel, a monk, whose studies showed that desirable traits can be bred into the plants. Through the years, many methods have been developed to genetically engineer plants making them resistant to pests and disease. GM plants may even contain more nutrients. Picture showing the difference between normal rice and the genetically modified "Golden Rice"
The use of genetically modified plants and crops has been the source of numerous controversies. GMO foods are known to cause serious allergies for some people. This is caused by the foreign proteins introduced into the plants. The proteins added could be from a plant that they are allergic to causing a reaction. Also, some genetically modified plants are engineered to be resistant to diseases and viruses by adding antibiotic genes to the plant so that the resistance to these diseases is built in. These antibiotics can remain in the consumer's body and actually reduce the effectiveness of antibiotics medications. This effect is being observed in hospitals around the world. Scientists also worry that these modified varieties will escape into the wild and create 'super-weeds' that will be virtually impossible to eradicate using common herbicides. Or, they may start growing in the wild and create a competition that will drive the native plants into extinction. Brief explanation regarding common myths and truths surrounding the topic of genetically modified crops. ↑ Murnaghan, Ian. Types of Techniques Used to Genetically Modify Food Genetically modified foods.co.uk. Web. Date of last update: 26 November 2014. ↑ P., Byrne. Genetically Modified (GM) Crops: Techniques and Applications Colorado University. Web. Date accessed: 26 April 2015. ↑ Duvauchelle, Joshua. Pros & Cons of GMO Foods Livestrong.com. Web. Date of last update: Jan 13, 2014. ↑ Keenan, Chris. Top 10 Most Common GMO Foods The Cornucopia Institute. Web. Date of publication: 19 June 2013. ↑ Murnaghan, Ian. What are the Most Common GM Foods? Genetically Modified foods.co. Web. Date of Last Update: 30 January 2015. This page was last modified on 29 October 2015, at 19:33.